This is a beautiful story of honor and love. 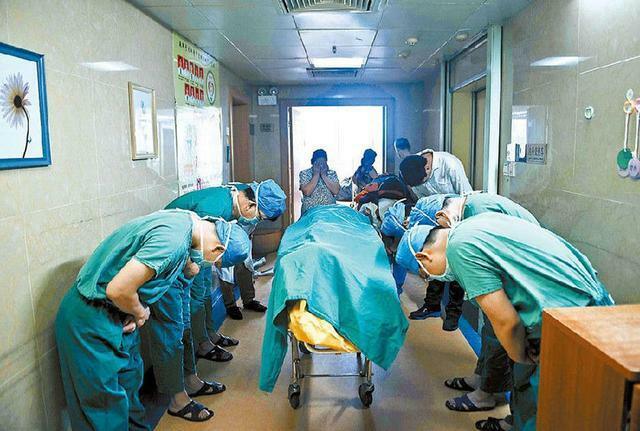 The picture of these surgeons and medical staff bowing before this young boy Liang, who died of a brain tumor, moved me deeply and reminded me of my own son who donated his organs at nine years. May we always remember to bow our heads and honor those who have the courage to keep giving, even after death. Liang was diagnosed with a brain tumor at the age of nine, just after he moved to Shenzhen to join his brother and sister, and to attend primary school. Before passing away on June 6, Liang told his mother, Li Qun, that he wanted to donate his organs. “There are many people doing great things in the world,” he said. Liang’s mother honored his wishes and doctors were able to save his kidney and liver for donation. The medical staff bow before him as a sign of honor for his gifts. Extremely moving, and very humbling. There is no giving with a greater power. I believe this too Hariod. Your comment is beautiful. Beautiful. May I post this on my Facebook? After the tragedies in Paris, we all need something like this, I believe. Yes of course Emilie. The Paris attacks and tragedies have indeed moved us today. Thankyou. This is absolutely beautiful. Karen. Sad that the young boy had to die, but he went out with such love and generosity. I am touched that the medical staff honored him in that way. Thank you Karen, my friend. I was touched too Mary, and I wish this was a practice in all our hospitals. Thankyou. I agree. We can all learn from this special act of kindness. Thankyou Val. I think this is another example that reinforces the message that each of us has gifts we can share with the world if we choose to. This is a beautiful picture demonstrating respect and appreciation regardless of age, gender or race of the individual. A lesson to be learned by all. It is a picture of respect and appreciation. Thanks Jonathan. Very touching and beautiful acting Karen. This is so touching, Karen. Giving life instead of taking it. Respect instead of disrespect for life. I agree Helen. So true. Humbling and thank your beautiful son for giving others the gift of life. This photograph speaks so eloquently as to how we should treat others all the time, with respect. Thank you for sharing. My hope is that is how we treat each other, it connects us to respect and love. Thankyou. Such wisdom, courage and caring from one so young…Like DK–moved. It’s true, often the young have immense wisdom. We can all learn from this. Thankyou Lori. It was a touching picture and story Yvonne. Thankyou for being here with us. It is very special. Thankyou Vicki. Wow! Thanks for sharing this Karen. As a mum it has been tragic for you to loose your son so young, but a great maturity and strength has risen from within you to be a wonderful blessing to others, by reaching for the treasure in the trial, and enriching us all through your blog. Thankyou Ashley for your heartfelt comment. I appreciate it.